You can participate by nominating someone you think is a Langley Environmental Hero! Nominations forms are available each spring. The Langley Environmental Hero Award began in 2006 as a way to acknowledge Langley’s grass roots efforts, both big and small, to protect the environment. 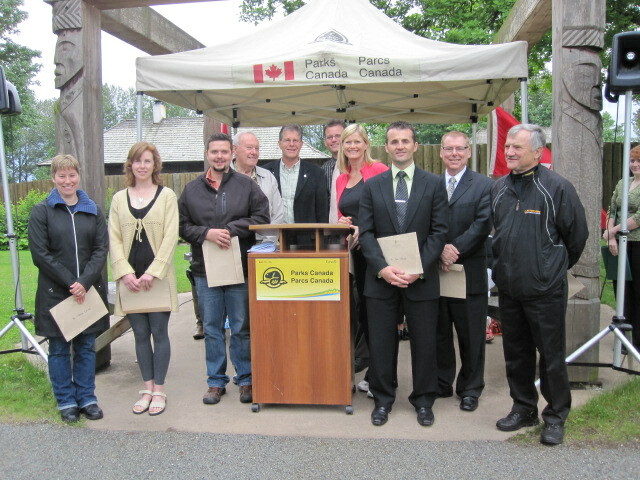 It is a program offered in partnership with MP for Langley-Aldergove Mark Warawa, the Langley Times, Langley Township, City of Langley, The Fort Langley National Historic Site, TD Bank and LEPS. Nominations are accepted year round, please click here for this year’s nomination form. The winner of each category will be awarded a prize of $500, to be donated to the local environmental organization of their choice. 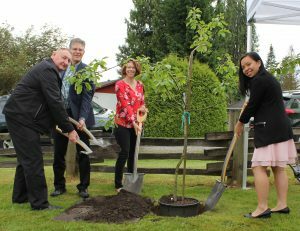 The winners will also be recognized in June at the Fort Langley National Historic Site with a plaque and a heritage apple tree planted in their honour. DEADLINE FOR SUBMISSIONS: the deadline for submissions for the 2018 heroes is April 20, 2018. The 2017 Langley Environmental Hero Awards received 14 nominations to recognize the efforts of the community in conserving our natural environment. Phil Wilford– nominated by Paul Koros. Phil Wilford is an environmental entrepreneur and long-time Langley resident. Through his company, Jentek Environmental, Phil is recognized as a world leader in the technology of portable cascading soil remediation units. Jasmine Lee– nominated by George Bryce, recognizing her work with R.E. Mountain Aquaponics, a small scale ecosystem in which fish provide fertilizer for growing vegetables, which are donated to local food banks. Northern Spotted Owl Recovery Program (Karen McKeogh)– nominated by Katelyn West. The Northern Spotted Owl is one of Canada’s most endangered species, with fewer than 20 individuals remaining in BC. Through artificial incubation and hand-rearing of newborn chicks, the NSOBP will soon begin the process of releasing Spotted Owls back into protected forests. The winner of each category was awarded $500, to be donated to the local environmental cause of their choice, and a heritage apple tree was planted in their honour at the Fort Langley National Historic Site. Congratulations to all the nominees! Keep up the good work. 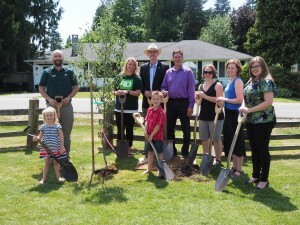 Anne Blaauw– nominated by Dr. David Clements for establishing the Blaauw Eco Forest in Langley. The family donated millions of dollars for the project in memory of Ann’s late husband, Thomas Blaaw. This generous donation was part of a covenant agreement with Trinity Western University, whereby the University will preserve it for education, research and community engagement. Students at TWU have benefited greatly from the research opportunities that this site offers. By sacrificially protecting this land, Ann Blaauw has provided an exceptional legacy to be enjoyed by future generations of Langley citizens and all others who visit this very special place. Painted Turtle Project, Andrea Gielens- nominated by the Little Campbell Watershed Society for their efforts to bring back sustainable populations of the Western Painted Turtles to our watersheds in Langley and the lower mainland. This organization works with the Greater Vancouver Zoo and Wildlife Preservation Canada, and educates homeowners and community groups on the presence of these native turtles and what they can do to preserve their habitat. The biologists, in particular Andrea Gielens, are passionate about sharing their knowledge. The organization goes above and beyond expectations and is committed to bringing these turtles back to our watershed. Desiree Chek-Harder– nominated by Penny Carnrite. In grade 10, Desiree joined the Green Team at Langley Fine Arts School, to volunteer in the Fort Langley Community Garden. The garden is used to educate students on the importance of sustainable development, organic gardening and food security. During Desiree’s first year, she built the garden composter and helped with the garden maintenance. In grade 11, she took on a leadership role by helping to organize the school program, liaise with the township and build a greenhouse in the garden. In grade 12, she became chair of the Green Team at Langley Fine Arts. She is a role model to the younger students at our school, and a fine example of an environmental and community leader. Seyem’ Qwantlen Business Group won for their commitment to environmental stewardship and for working to benefit local species and habitats. This organization has conducted studies and awareness campaigns to raise the profile of two at-risk species: the Salish Sucker and the Eulachon. Seyem’ Qwantlen also initiated a study on the Western Painted Turtles in the lower Stave region, and hosted Walking Tours last summer to educate local community members about the sensitive ecology of Fort Langley. Seyem’ Qwantlen is dedicated to environmental stewardship and aims to lead by example. Gavin Salingre and his sister Aubree, aged 6 and 4, won in the Youth category for caring for the environment through picking up garbage on their street. Every week, Gavin and Aubree are excited to put on their special vests and get out their garbage pickers. There have been times when neighbours would “drop” loonies in the grass for the children to find among the garbage. Adopting their street by regularly picking up bottles and trash has taught the children about the importance of a clean neighbourhood, taking pride in their community, and caring for the earth. Marlee St. Pierre won in the individual category. Through her work at the Yorkson Creek watershed and her efforts to educate children about nature, Marlee has demonstrated exemplary environmental stewardship and the desire to pass on her skills and knowledge to the next generation of Langley youth. For the past 10 years, Marlee has organized the Young Naturalists afterschool program at James Kennedy Elementary School, which teaches children about nature and the surrounding environment through hands-on learning and information sessions. Marlee has also organized many positive environmental activities at the school, including litterless lunches, Earth Day awareness, and the planting of native tree and shrub species on the school’s grounds. 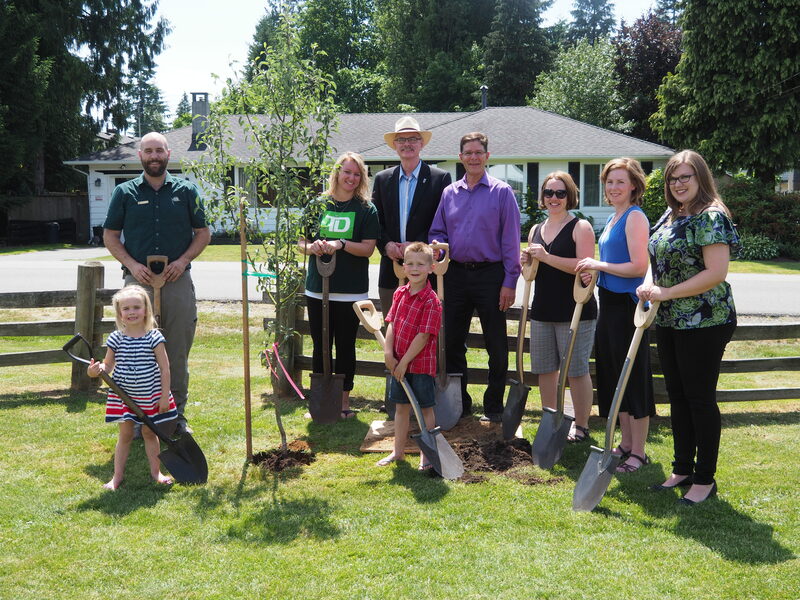 Two organizations were awarded Environmental Hero Awards in this category: the Arboretum and Botanical Society of Langley won an award for the many hours of work spent enhancing the Derek Doubleday Arboretum. Roots and Wings Montessori School also won the award for practicing ecological principles and for educating its students about sustainable living. Dianne Kask is a retired school teacher from Aldergrove and active member of the Betrand Creek Enhancement Society, where she has spent many hours removing invasive species from riparian areas, participated in countless garbage cleanups and tree plantings, and volunteer her time as the coordinator of the Parkside Elementary School environmental club, bringing hands on environmental education opportunities to students. Maxime Labreque In his volunteer work with LEPS, Maxime has been involved in clearing brambles, eliminating invasive species and general care of the community garden. He also volunteers at the Raptor Ranch where he performs bird handling, basic medical intervention and falconry. Further, he works with Hives for Humanity to maintain two beehives. Langley Field Naturalists The field naturalists have made significant stewardship efforts over the past 33 years including inventory of the Mountainview Crown Lands, inventory of natural areas, yearly garbage clean-ups, adoption of two trails, stewardship of the Hope/Redwoods Conservation area and protection of the Brydon Lagoon. Other business nominations included: Great Canadian Oil Change, Watchers of Langley Forests, Roots and Wings Montessori School, T&P Trucking Ltd., A Rocha Canada, Coast Spas, McElhanney Consulting Services, and Leo Mitrunen Development Corporation.